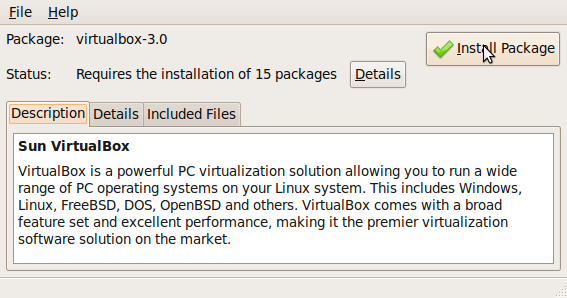 Learn how to install Sun Virtual Box Virtualization machine software on Ubuntu 9.04, so you can run other Operating Systems like Windows XP, Fedora, Debian, etc within Ubuntu without the need to partition your hard drive, and creating a dual boot machine. virtualization is a great way to learn how to install and use an Operating System without the risk of losing your data because you accidently deleted your files while partitioning your Hard drive or something went horribly wrong. The downside when running a virtual machine is the slowdown it can cause to your computer if your computer has a slow CPU, not enough Memory, and small hard drives. 1. Go to http://www.virtualbox.org/wiki/Linux_Downloads and pick the Ubuntu 9.04 (“Jaunty Jackalope”) i386 if your computer has a 32bit CPU like a Pentium 4, or Pentium 3. Pick AMD64 if your CPU is an AMD 64bit CPU. 2. Download and Save the installer file for Virtual Box to your desktop. 3. 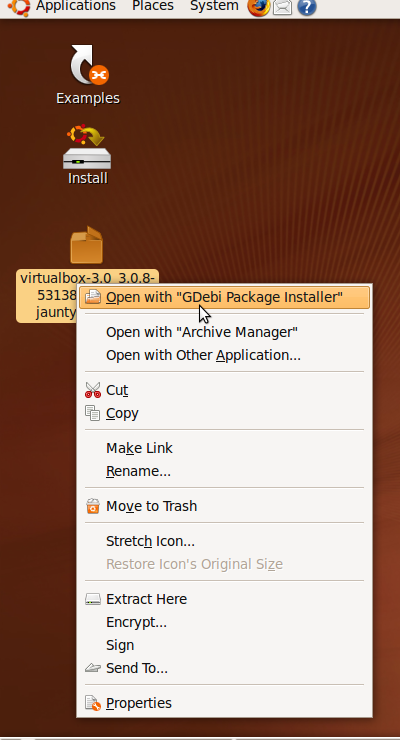 Right click the file and pick Open with GDebi Package installer. 4. Click on Install Packages and type in your Administrative Password. You need to press forward two times on a pop up window when it pops up. 5. Click on Applications > System Tools > Sun VirtualBox to start VirtualBox.